Solar energy, as a renewable and abundant source of energy, is increasingly gaining acceptance and usage globally even for small gadgets like charging power banks. Due to the encouragement of the use of this energy to dissuade the usage of fossil fuels, most gadget users have pre-installed solar devices to reduce electricity consumption. And since the majority of people panic when their smartphones and tablets are running out without an external source of energy to charge it up, they have taken to the practice of having back up power banks. 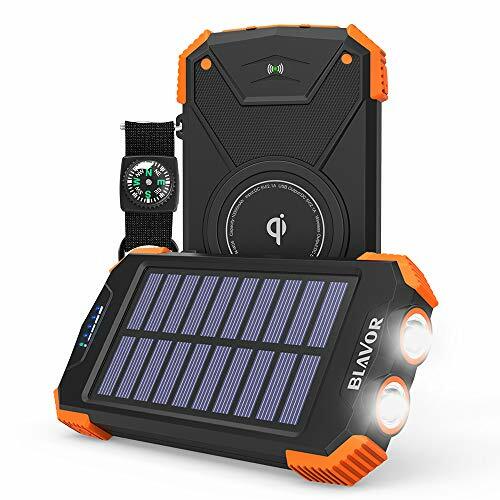 Solar power banks are some of these gadgets, but powered using solar energy. 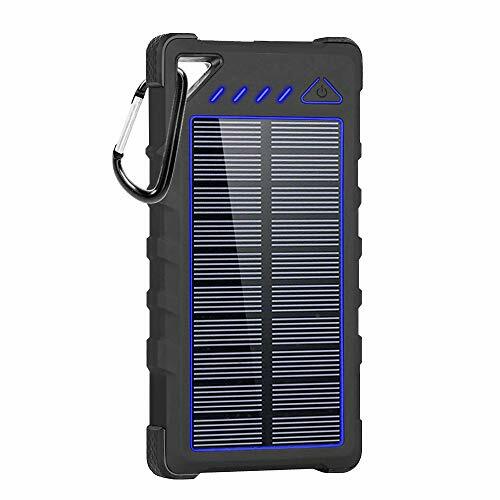 At times when we are out in traffic or camping, away from electricity and our gadgets need charging, solar power banks offer the best solution because they can be used on the go provided there is sunlight. 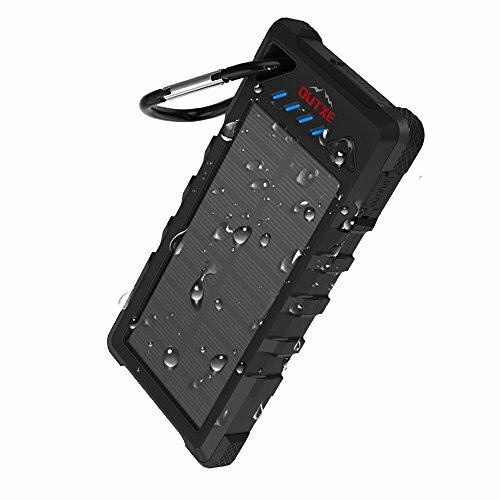 However, having the right solar power bank would prove even more efficient for a frequent user. 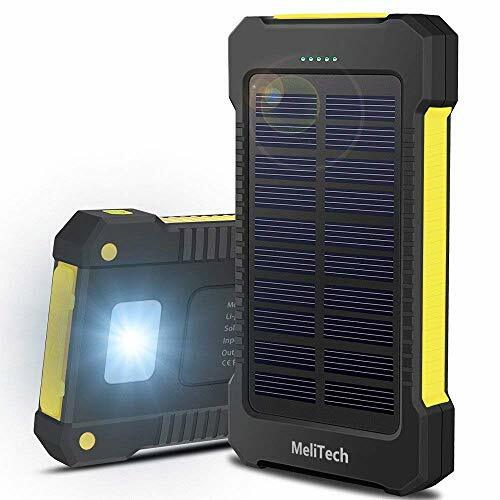 Here are the 11 best solar power banks for you, and interestingly, you can easily find them on amazon by following the links! This 10,000mAh power bank is useful especially for outdoor enthusiasts. This Qi portable charger is compatible with iphone XR/ XR MAX/ XS/ X/ 8/ 8plus, Samsung Galaxy S9/S9plus S8/S8plus and all qi-enabled devices. It is truly cable-free and tangle-free. The wireless power bank is made of premium ABS fireproof materials, highly sturdy and durable. The solar power bank itself can be charged via power outlet(micro usb and type C input port) and sunlight. It can be fully recharged around 6hours with 5V/2A adapter, can charge iphone7plus up to 2.2 times, iphoneX up to 2.3 times, iphone8 up to 3.5 times. 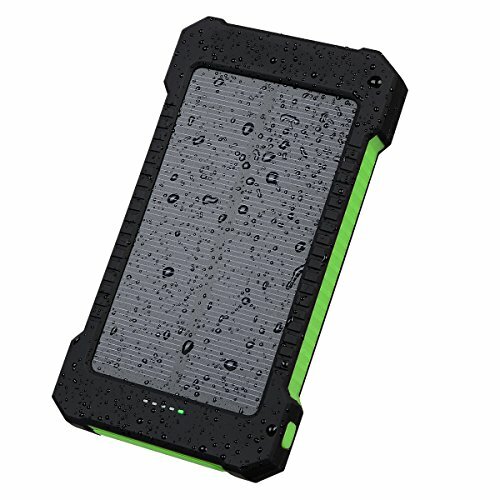 MeliTech portable solar charger waterproof mobile power bank has high capacity – 20000mAh lithium battery. It can charge up your phone for 4-5 times if the battery has full energy. It comes with dual USB port and can charge up your iphone, iPad, cell phones, tablets, camera, bluetooth headphones, etc. 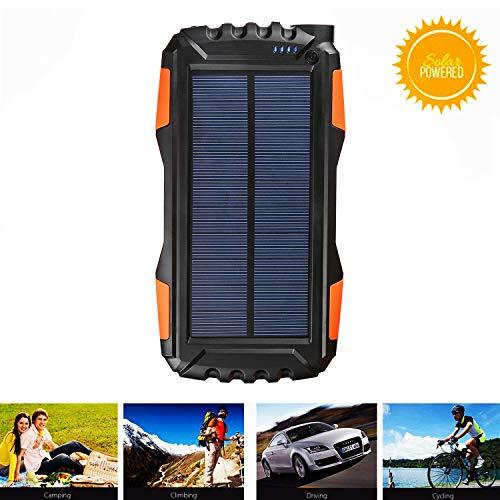 This portable solar power bank has got portable design which makes easy to hang it on your bag pack with the strap, hands-free on the go, enjoy portable power while camping, hiking, traveling, expedition and other outdoor activities. It is an ideal outdoor power bank. It is covered with a wear resistant plastic. In addition, it is water proof, shock proof and dust proof. It has two charging ports that enable two gadgets to charge simultaneously. It has LED indicators that can serve to send an SOS signal in times of distraught. It is also fitted with LED light that acts as a torch especially during the night. 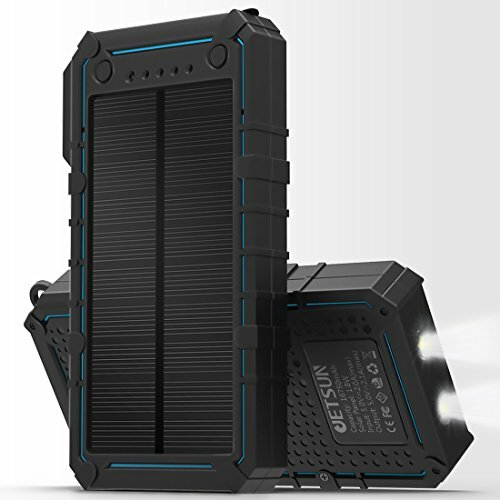 With a 16750mAh battery, the JETSUN packs quite a lot of capacity as a power bank. Full charge takes about 10 hours which is way above that of other high end power banks. This is one of the best water proof and dust proof power banks in the market. It can last for 30 minutes under 100cm of water. It has placing grips that ensure it doesn’t slip off your hand when in use. Furthermore, it is fitted with a hook that one can hook to a bicycle or belt and move easily without it falling. The fact that it is one of the lightest power banks makes this easy. It also comes with an in-built LED light that can be used as a torch at night. Its capacity enables it to charge heavy duty devices effectively. This power bank is ideal for its protection against over-heating, shirt-circuiting and over-charging. It is one of the most portable power banks due its small size and light weight. 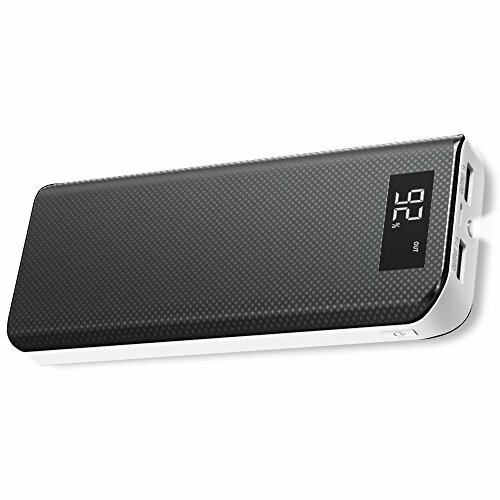 At 16000mAh it has a decent capacity that enables it to last long and also to charge longer. With its two ports it can charge two gadgets simultaneously making it a dual user power bank. It has a bright LED flashlight enabling it to be used as a torch during the night when there is no sunlight. In addition, it has a protection system that improves its protection protocol for the devices preventing short circuiting. It also has a sturdy build enabling it to be useful for outdoor activities. 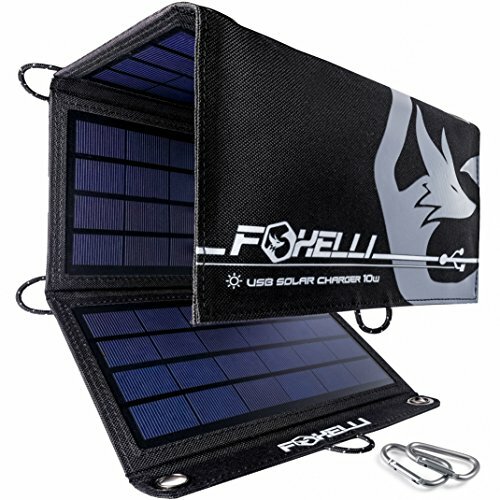 Foxelli solar power bank has Polycrystalline cells which provide this solar panel charger with enough power to charge 2 devices at the same time! Its smart charging technology recognizes the input needed for a connected device and distributes current output accordingly, delivering up to 1.85A in total and cutting down on total charging time. You can use this solar phone battery charger with any USB powered device with 5V DC input voltage. You can easily take this charger with you on any outdoor adventure! It weighs only 1.23 lbs and is ultra-thin (1.2” folded). It has good capacity that can charge up phones for a long time. It has two USB ports that empowers it to be used by multiple devices at the same time. With a speed of 2A, it is faster than most power banks and thus, preferable for charging gadgets. Also, this power bank is able to adjust the current of the gadget to avoid over voltage of the device. It has a rugged feature that optimizes it for the outdoors. It also comes with hanger, meaning, one can hang it when not in use or even towards sunlight. It is fitted with light and a lighter for starting camp fires or a simple cigarette light. Kiizon solar power bank has 25000 mAh battery which is enough to charge cell phones 7-8 times. 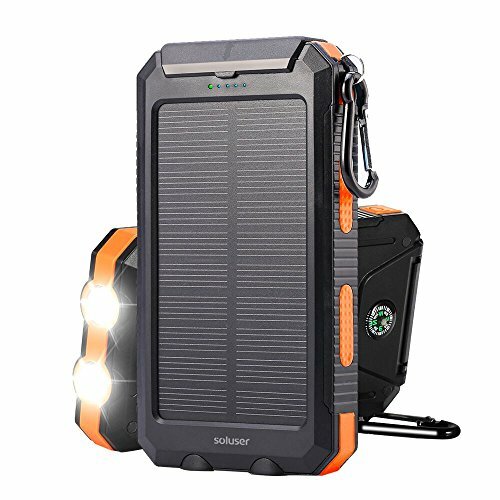 It is perfect for backpackers and campers, as well as for times when your home’s power is knocked out by a storm or other emergency situation. With dual USB Output, you can charge two devices at the same time. When the devices are fully charged, the charger turns off automatically. It has also got built in LED light that can be used as a flashlight or for emergency lighting at night. The charger is protected against rain, dust and shock and the Intelligent Protection System effectively prevents your devices from overcharge, overcurrent and short circuits as well. This Portable Charger can be recharged when it under the daylight. It has got double flash LED lights. They are bright that when you are walking on dark or camping at night. With 3 usb ports, it can charge 3 devices at the same time! The high speed of the Soluser (2.1A) compensates for its small capacity. It has one of the highest speeds making it charge faster than power banks with larger capacity. Also, the power bank is water-proof, shock proof and dust proof. It is easy to walk around with and charge as it can be hooked to backpacks for mobility. It has 2 LED lights that are optimal for use during the night. 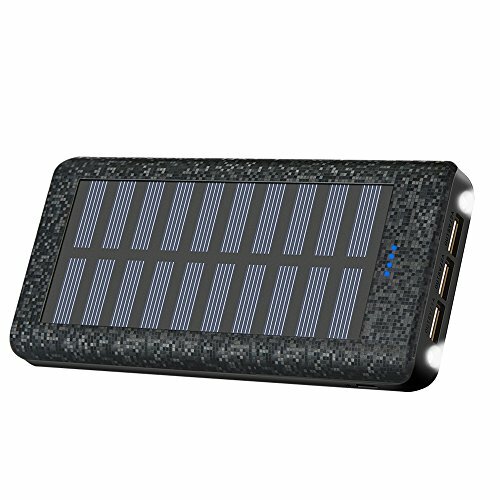 This power bank is fitted with 2 solar panels that provide an effective way of charging the power bank. Accordingly, it takes about 25 hours to charge fully, which is about half the time taken by most power banks. However, there has to be strong sunlight to enable this. It has a speed of 2.1A enabling it charge extremely fast making it one of the fastest power banks, ahead of the OLEBR. The power bank has two charging ports. The Hiluckey has an in-built chip that enables it to adjust the current it dispenses to the devices. This prevents over-charging of the device as well as protecting them from excessive voltage which can be detrimental to the electric gadgets. The power bank has a stellar build that is waterproof and can absorb shock releases during charging making it shook proof and thus, suitable for any situation. Next articleCan Fish be the Next Force for Cruise Liners?